Where in Princeton can you live most easily without a car? Part of the answer lies in transit availability. Princeton has four local transit services: our NJ Transit bus lines (the #605 and #606), Princeton University’s TigerTransit shuttle bus routes, the town’s FreeB jitney, and, of course, the Princeton Branch ‘Dinky’ rail connection to West Windsor. 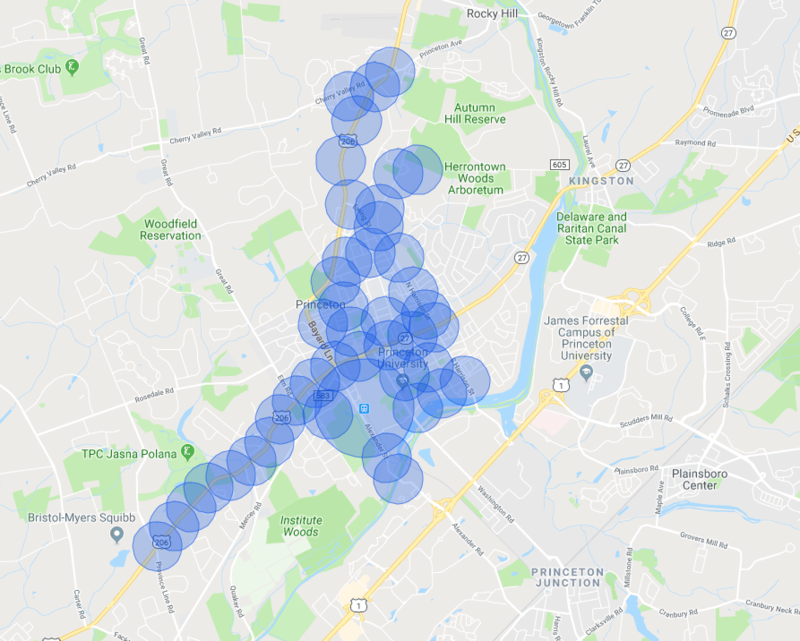 We used a tool designed by Oliver Beattie (find it here) to map where in Princeton is within 0.25 miles (about a 5-minute walk) of a transit line. 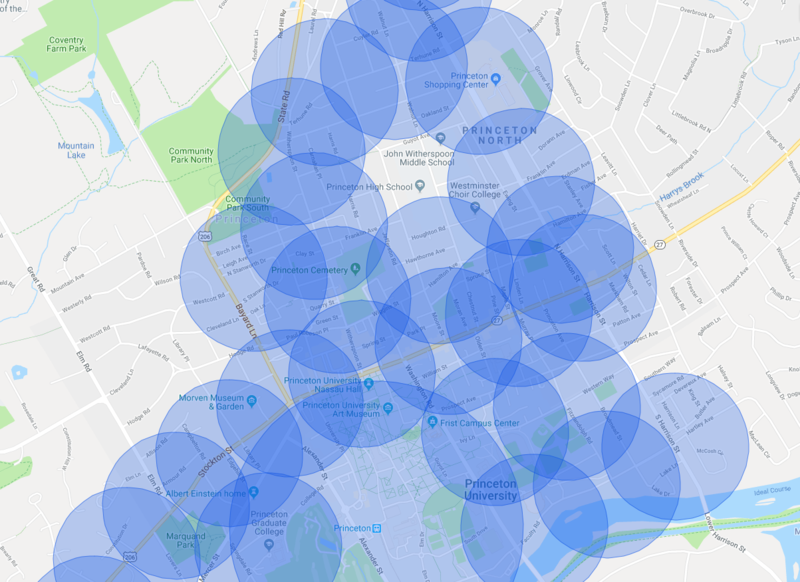 As you can see from the picture above, much of downtown Princeton is close to one or more transit lines. Looking further out, we can see that the Littlebrook and Princeton Ridge areas have very little transit connectivity. It *is* possible to ride a bus to downtown Princeton or Trenton from the Mt Lucas village neigborhood, at the northern town line, around where Route 206 intersects with Cherry Valley Road. All the areas near Route 206 in the south-west side of Princeton are also on the #606 NJ Transit bus line. More of the town is therefore close to transit than you might expect, although the buses don’t come as often as many users would prefer. Track NJ Transit buses here. Track the municipal FreeB jitney here. Get NJ Transit rail times for the Princeton Dinky train here. This post was edited 4.19.18 at 4 pm. The mapping tool was created by Oliver Beattie. This entry was posted in Alternative Transportation, Princeton and tagged Princeton, Transit. Bookmark the permalink. 3 Responses to Where In Princeton Is Near Transit? You are ignoring the Suburban Transit line which is used to commute to work locally and to NYC. I worked out how long it would take to commute from the top end of Mount Lucas Road to Newark Penn Station. It’s about 2.5 hours. It’s about 2 hours if you live near the Dinky. And 90 minutes if you drive from the top end of Mount Lucas Road to Princeton Junction Train Station and then take the train to Newark Penn Station. I worked out how long it would take to commute from the top end of Mount Lucas Road to Newark Penn Station via public transportation options. It’s about 2.5 hours. It’s about 2 hours if you live near the Dinky. And 90 minutes if you drive from the top end of Mount Lucas Road to Princeton Junction Train Station and then take NJT to Newark Penn Station.